"The other day I tried to open my car with my TV remote and I don't even know how I had the TV remote in my hand. "I don't want my daughter's first memories to be of me being a struggling, broken human being with a brain degenerative disorder that can't learn to love or learn to accept reality," he adds. At just 38, ex-NFL player Larry Johnson believes he is battling a degenerative brain disease that leaves him with memory loss, mood swings, headaches and suicidal impulses. The condition - chronic traumatic encephalopathy (CTE) - is linked with repeated head trauma but can only be diagnosed after death. It's been found in the brains of dozens of former American football players, and the NFL has a $1bn (£665m) compensation bill to pay. Johnson retired in 2011. He is unable to remember two whole seasons. He only learned of CTE when watching the 2015 film Concussion - starring Will Smith. "What do I expect when I'm 40, 45 or 50?" says Johnson, who spent nine years in the NFL. "If I had a 100% certainty I would be able to do different things, change my diet, see different doctors or get into different medicines that can slow down the process of CTE actually forming. "The worst symptoms are the forgetfulness and the irritable moods that I go through on a daily basis. It's hit and miss, I'll be fine and then 10, 15 minutes later I am sad for some reason, get into a depressed mood, and then can be happy right after that. "I am a little bit more hypersensitive to sound, I am hypersensitive to being around a lot of people, certain noises irritate me. "If I can't stand a certain smell I have to remove myself. I get headaches if it's too bright. I have to go to dark places to get back to normal. "Then there's forgetfulness, I will pick up my keys in my hand, and then spend 10 or 15 minutes looking for my keys while they are in my hand." 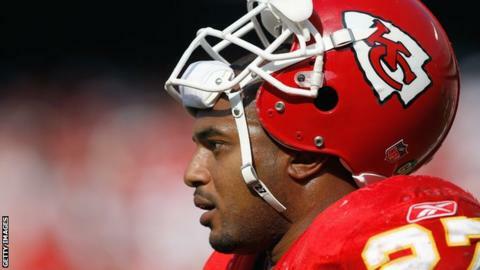 After six years at the Kansas City Chiefs, Johnson had spells with the Cincinnati Bengals, the Washington Redskins and the Miami Dolphins. He admits leaving the game was difficult but believes dealing with the mood swings brought about by CTE also pushed him to seek out "toxic" solutions to fix a state of "depression". Johnson was arrested six times between 2003 and 2014, five of which were related to assault against women. "In 2010, it had me sitting in a room with a bottle of alcohol not knowing what day it was or if I wanted to be here," added the former Penn State University All American. "It warps your brain into a reality that's not your own. "In that ball of confusion you search out every toxic component you think is going to help you be a better person, it actually destroys you even more. At that point I was questioning my own mortality because I didn't know where this had come from. "Me being a very strong and proud person from a strong and proud family, you don't admit when you are weak, you don't show when you are vulnerable, you only show strength. So I bottled up most of these explosions in myself and it always leaked out and always got me in more trouble." There is currently no specific treatment for CTE. In July, the Journal of the American Medical Association released an updated study reporting that out of 111 brains of deceased former NFL players studied, 110 (99%) had CTE. "Recovering from losing a football career is a very hard thing to do if you're an athlete. I had to really start from rock bottom to work myself up to be in the same room as myself. "My daughter was born in 2010 and when she was two or three I still suffered but kept it under control," he adds. "I knew if I didn't get my life right I was going to lose myself and my child or custody of my child, and I didn't want any of that to happen. "She would give me hugs, kisses, love - as a father raising a daughter that is an amazing feeling, so she brought me back from me not wanting to be around, being so scared I don't know what to do with the rest of my life. "I am in a beautiful place right now. I have learned how to safeguard myself from toxic behaviours that I know are going to send me down the wrong path." Larry Johnson was speaking to BBC World Service's Steve Crossman.